Even after massively increasing production of the Model 3, Tesla still hasn't managed to offer the car at its touted price of $35,000. Tesla is finally making a profit. For the first time, the California-based electric carmaker has posted two quarterly profits in a row. Those profits were driven by pricey cars — higher-priced variants of Tesla's new Model 3, which sell for $50,000 and up. But instead of doubling down on the strategy that proved profitable, Tesla is laying off thousands of people to slash costs, reducing production of the Model S and Model X and building a new factory in Shanghai. It's all part of an aggressive push to make cars for the mass market that sell for $35,000. That's because Tesla CEO Elon Musk doesn't want to just sell expensive cars to the world's elite. He never did. Musk called it his "Secret Master Plan." The "secret" part was a joke — he talked about it all the time. But the "master plan" bit was very serious. Step 1: Make a high-performance, extremely expensive electric sports car, something people would be willing to plunk down $100,000 for: the Roadster. Step 2: Use that money to make a cheaper vehicle — and use that money to make an even cheaper one. Eventually, Musk said, the company would mass-produce a truly affordable electric vehicle. The underlying goal was nothing short of saving the world. A few rich people driving electric sports cars wouldn't shift the needle on climate change. But an electric car for everyone? That could do it. Musk has been remarkably consistent on this vision. In 2006, he wrote that the company's "overarching purpose ... is to help expedite the move from a mine-and-burn hydrocarbon economy towards a solar electric economy." At the end of 2018, he told 60 Minutes, "The whole point of Tesla is to accelerate the advent of electric vehicles and sustainable transport and trying to help the environment. We think it's the most serious problem that humanity faces." Mass-market cars, like Tesla's Model 3, were key to this vision. But scaling up production is notoriously difficult. The last year and a half has been painful for Tesla, as the company coped with production challenges and delivery woes. Tesla has massively increased production of the Model 3: The company sold nearly 140,000 Model 3s last year. But it still hasn't managed to offer the car at its touted price of $35,000. It's still trying, despite the challenges: "The road ahead is very difficult," Musk told employees on Jan. 18. In the meantime, Tesla is competing successfully with conventional luxury brands. Still, it's not like Musk's master plan is entirely at odds with business interests. 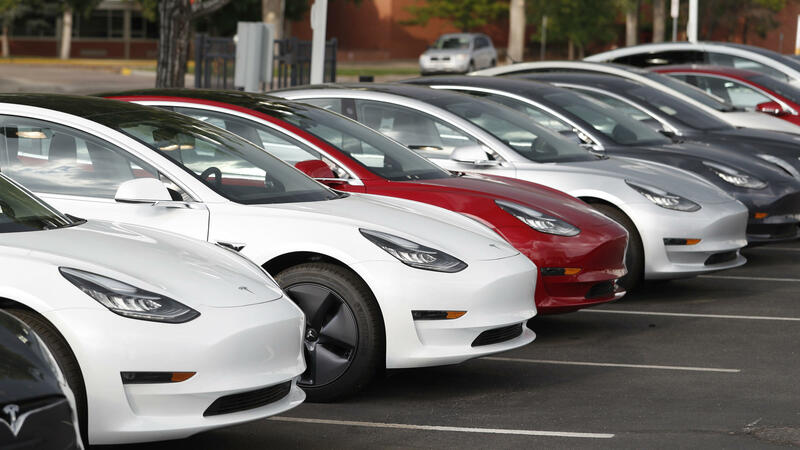 "At the end of the day, Tesla is a for-profit company — it's not a nonprofit," says Jessica Caldwell, the executive director of industry analysis at Edmunds. "It's going to have to make money." "Elon Musk and Tesla having this grander vision for humanity and civilization is certainly different than the way that other auto companies run their business day to day," she says. But building a car for the masses also opens up new markets that could help the bottom line. "Tesla's up against the wall," she says. "It feels like there are some real business pressures on them." The company has already blown multiple self-imposed deadlines for the Model 3. Meanwhile, traditional carmakers are investing serious money in bringing new electric cars to market. That, of course, was always part of Musk's plan — but it means new competitive pressure, too. Investors and analysts are waiting to see whether Tesla can pull off the long-planned transition to high-volume, low-cost vehicles. And would-be buyers are waiting, too. Mark Vidaurri of San Antonio test-drove a Model 3 a few weeks ago. He loved it — but was let down by the price tag. At well above $35,000, it's out of his reach. "I believe advancements in technology shouldn't be a luxury," he says. "It should be something that is discovered and ... able to distribute across every class of citizen." He still dreams of a Model 3 in his driveway. Someday — when it's more affordable. Tesla sells electric cars - expensive electric cars - and it's finally making money doing that. Yesterday Tesla announced its second quarterly profit in a row, which might be great for the company if CEO Elon Musk wanted to make money just selling expensive cars. He doesn't. NPR's Camila Domonoske explains. CAMILA DOMONOSKE, BYLINE: Musk called it his secret master plan. The secret part is a joke. He talked about it all the time. But the master plan, he was serious about. Step one was selling a super-fancy electric sports car, the $100,000 Roadster. Step two was using that money to make cheaper and cheaper cars. Musk spoke directly to his customers at the unveiling of the Roadster back in 2006. The video was posted by Netscape and Autoblog. ELON MUSK: Anyone who's considering buying this car is - you know, you're not just buying a sports car. You're actually helping pay for development of the mass-market vehicles. DOMONOSKE: Cheap electric cars - and a lot of them - that would sell so well, it would push all carmakers toward going electric. That was always Musk's goal because what he really wanted was to save the world. The master plan was to fight climate change. Here's Musk at the unveiling of the Model X in 2012. MUSK: The world desperately needs sustainable transport. If we don't solve this problem this century, we are fracked. DOMONOSKE: So that was the vision. But making mass-market electric cars is really hard. Tesla is producing a less-expensive car, the Model 3. But the process of ramping up production was painful, and the Model 3 is still only sold for way more than the target of $35,000. Brian Moody is the executive editor for Autotrader. He thinks Tesla should just admit that it's a premium carmaker. BRIAN MOODY: We can just be honest and call them luxury cars. And I don't think there's anything wrong with that. DOMONOSKE: Tesla has shown it can turn a profit off cars that cost $50,000 and up. MOODY: They've created something great that people love. Good. Congratulations. You should enjoy your success and keep doing more of that. DOMONOSKE: Tesla is not interested in doing more of that. The company recently announced it's laying off thousands of people. MUSK: We have to be relentless about costs in order to make affordable cars and not go bankrupt. That's what our headcount reduction is about. DOMONOSKE: That was Musk on a call with investors yesterday. And Tesla's building a new factory in Shanghai in addition to its factory in Fremont, Calif., again, to help make that affordable car. We should note this is not only about fighting climate change. JESSICA CALDWELL: At the end of the day, Tesla is a for-profit company, right? It's not a nonprofit. DOMONOSKE: Jessica Caldwell is the executive director of industry analysis at Edmunds. She says, yes, the company is idealistic. CALDWELL: Elon Musk and Tesla having this grander vision for humanity and civilization is certainly different than the way that other auto companies, you know, run their business day to day. DOMONOSKE: But making cheaper cars would also be good business. It means a bigger pool of potential customers. And if it's going to happen, it's got to be soon, she says. CALDWELL: Tesla's up against the wall. There are some real business pressures. DOMONOSKE: Tesla has said for years that the cheap car was just around the corner. But it never actually turned that corner. Now traditional automakers are investing serious money in bringing new electric cars to market and would-be Tesla buyers are waiting to see if the company can keep its promises. MARK VIDAURRI: Instead of getting an Infiniti, I would rather get a Tesla. You know what I'm saying? DOMONOSKE: Mark Vidaurri (ph) in San Antonio, Texas, test drove a Model 3 a few weeks ago. He loved it, but he felt let down by the fact that the price is still much higher than $35,000. VIDAURRI: I mean, even if you were to go with all the cheapest options, you're looking at, like, $600 to $800 a month. With a monthly payment like that, you know, in everyday life, with me and my wife working - I mean, we work full-time jobs - it's just not in the cards. DOMONOSKE: He hopes that cheaper car is coming. VIDAURRI: I believe advancements in technology shouldn't be a luxury. It should be something that is discovered and being able to distribute across every class of citizen. DOMONOSKE: Including people like Vidaurri, who dreams of a Model 3 in his driveway someday. Camila Domonoske, NPR News. Transcript provided by NPR, Copyright NPR.